Ans: Bryophytes are terrestrial plants. They mostly grow is moist and cold habitats. Some species can grow in dry places. But they depend upon on moisture for the reproductive stage. Bryophytes have world in distribution. They found is tropical, temperate, subarctic and arctic regions. What type of sporophyte is found in Bryophytes? Ans: Sporophyte is totally or partially dependent on the gametophyte for its nourishment. It has simple structure. It is differentiated into foot, seta and capsule. The cells of the sporophyte are diploid. How does vegetative reproduction occur in bryophytes? Ans: Vegetative reproduction is common in bryophytes. It occurs during favorable growing season. Vegetative reproduction occurs only in the gametophytic stage. It takes place by the parts of the vegetative plant or by the production of special vegetative propagules. Ans: regular heteromorphic alternation of generation occurs in bryophytes. The gametophyte produces haploid gametes. After fertilization the oospore gives rise to diplopod sporophyte. The sporophyte produces the spores by meiosis. The spores give rise to the gametophyte. Thus, both sporophyte and gametophyte generations alternate with each other regularly. Give two similarities between bryophytes and algae? Ans: Some algae and all bryophytes show alternation of generation. Gametophyte is dominant in both groups. Both produces flagellated male antherozoid. Give two differences between bryophytes and algae? Ans: Algae are aquatic but bryophytes are terrestrial plants. Plant of algae is unicellular or simple multicellular in algae. But the plant body of bryophytes is multicellular and it forms tissues. Give two similarities between bryophytes and pteridophytes. 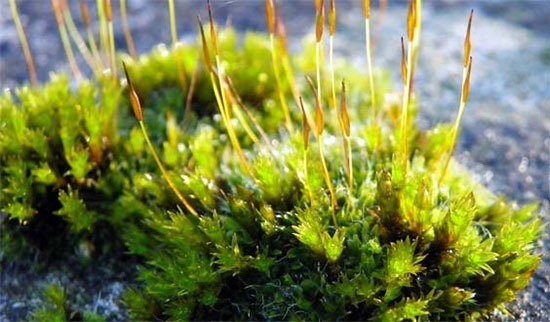 Ans: The rootless sporophyte of Psilopsida resembles sporangium of bryophytes. Both have terminal sporangia. Give two differences between bryophytes and pteridophytes? Ans: The Sporophyte of Pteridophytes is independent. It has root, stem and leaves. But the sporophytes of bryophytes are dependent on gametophyte. Vascular tissues are present in Pteridophytes but absent in Bryophytes. What is homologous theory about evolution of bryophytes? Ans: According to this theory, the sporophyte is not a new structure. It is produced as a result of the direct modification of the gametophyte. Thus, sporophyte was a part of gametophyte. Give occurrence of Anthoceros. Name its different species? Ans: Anthoceros grows on moist soil. They are present in shady places or in the crevices of rocks. Anthoceros erecrus, A. himalayensis, and A. chambensis are commonly found in Western Himalayas. How does growth occur in bryophytes? Ans: The growth occurs by single apical cell in initial stages. But mature plants have several scattered apical cells on the margin. So, growth takes place at many points. It forms mostly like thallus. What are Gemmae? Give their function? Ans: Gemmae are also produced on short stalk on the upper surface of the thallus. These are also act as vegetative reproductive bodies. What structure are produced by the divisions of endothelium and amphithecium? Ans: The cells of the endothecium divide to form columella. The cells of the columella are arranged in a square in the transverse section. Cells of the amphithecium divide to produce an outer layer of jacket initials and an inner layer of sporogenous tissue or archesporium. What is Apospory? In which plant does it occur? Ans: Certain cells of the sporophyte can develop into gametophyte directly under certain conditions. This phenomenon is called apospory. It produces diploid gametophyte. Apospory occur in Anthoceros. Ans: The superficial cells of the stem give rise to paraphylls. Papraphylls are filamentous outgrowths. They supplement the photosynthetic activities of leaves. What are tubers? Give their Functions? Ans: They are modified special underground branches. These are formed at the end of growing season. They remain dormant throughout the unfavorable conditions. Ans: It is horizontal portion and grows underground. It bears three rows of small brown or colorless leaves. It also bears rhizoids. The cells are rich in protoplasm and oil globules. Give structure of leaf of Polytrichum? Ans: Leaves have broad bases. Leaves in the upper portion are green. But the lower ones are brown. Each leaf has a broad colorless sheathing leaf base and narrow distal limb. ‘The mid-rib forms the major part of the leaf. These leaves possess extra photosynthetic tissue in the form of closely set vertical plates of green cells. These are known as lamellae. Green lamellae act as additional photosynthetic tissue. How fertilization occurred in Porella? Ans: The neck canal cells and the ventral canal cells of mature archegonia degenerate. They form mucilage-like substance. It exerts pressure and burst the cover cells. The mucilaginous fluid oozes out to ruptured neck and attracts the sperm. A large number of sperms collect near the neck. But that only one of them passes down and fuses with the egg to form the oospore. Ans: The flask-shaped archegonia are borne at the apices of leafy stems. Archegonium is surrounded by perichaerial leaves. These leaves overlap to form a closed bud-like structure. The archegonia occur in cluster of 3 to 6. What is Peristome? Give its function? Ans: Peristome is present in the form of a thick rim. It bears a number of rigid teeth. The epiphragm fills the space inside the ring of peristome teeth and is attached to their tips. Peristome teeth arise from the rim or diaphragm. How are spores dispersed in Polytrichum? Ans: Cells of the epiphragm dry up during dry conditions. It separates the operculum. The calyptra falls. Epiphragm also dries up between the peristome pores. The central tissue of theca region except the spores degenerates. Thus, the spores lie free in the centre of the capsule at maturity. Spores come out through pores. They are dispersed by wind.